We’ve told you time and time again the benefits of omega-3s when it comes to relieving joint pain and inflammation, particularly back pain. 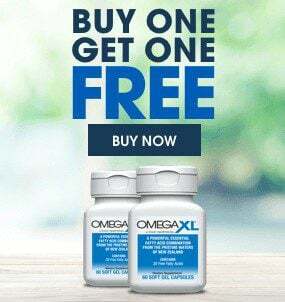 It is the reason we have devoted our resources and energy to provide you our OmegaXL—a powerful, essential fatty acid combination from the pristine waters of New Zealand. Now, your mind (combined with your OmegaXL intake), may also help reduce your back pain for good. A new study claims mind-body therapy can help reduce lower back pain, Reuters is reporting. The new research finds that patients who took part in these mind-body routines had visible improvements with their back pains, compared to those who did not take part in the mind-body sessions. he study involves both mindfulness-based stress reduction (MBSR) and cognitive behavioral therapy (CBT). “It’ll make a difference for them,” Daniel Cherkin, lead author of the Group Health Research Institute in Seattle told Reuters. So, how does MBSR work exactly? Firstly, it escalates a person’s ability to focus on thoughts, emotions and sensations via yoga exercise and meditation, experts say. The findings, also published in the Journal of the American Medical Association, include information on how CBT teaches individuals about the connection between pain and a person’s reactions and activities. CBT also assists people with knowledge on the best strategies to cope with pain. Dr. Cherkin and his team took 342 patients suffering from back pain and, in no particular order, placed them in three groups. The pain they experienced was not linked to any one cause, and all patients had been experiencing discomfort for over three months. The first group resumed their normal routines in treating their back pain. The second group was treated with MBSR treatment, and the third was treated with CBT. All involved were given eight weekly, two-hour group therapy sessions while the MBSR group was also taken for a six-hour retreat. Nearly 54 percent of participants took part in six or more therapy sessions. As of now, the only downside to these treatments is that people may have to pay out of pocket, or may have difficulty finding a physician to give them the treatments, according to Dr. Madhav Goyal of the North Bay Center for Primary Care in Vacaville, Calif.
For Dr. Jatin Joshi, a pain specialist at Weill Cornell Medicine in New York, exploring monetary avenues to help those in need of these programs is critical in the medical industry. “If you have a physician conscientious enough to bring these tools to you, have an open mind,” Joshi said. After all, as the old saying goes, a mind is a terrible thing to waste and not taking advantage of the cost-effective options for easing back pain— like OmegaXL— is also counter productive. So make sure to order your OmegaXL bottles today!